Scandalous death sells papers. But as the media frenzy feeds on the wealthy Thomas Anders, strangled to death with a black velvet rope in his plush Park Avenue apartment, Lieutenant Eve Dallas grapples with one question: a crime of passion or a cold extermination. 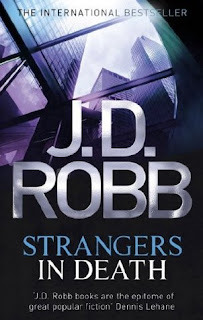 Strangers in Death #26 in the series, and it contains all that is good about this series. This one takes a slightly different tack in that there is no serial killer that Eve and her team are working non stop to get ahead of. Or wait, could there have been one at work? Loved the little bits like Eve stopping to interact with the young boy Tiko who sold her a scarf a few books back. I also liked the development for Charles and Louise, who when the book opens seem to be struggling in some way. The mystery of murder with Eve finally cracking the code and stage managing the final showdown, the sharp, witty dialogue, the minor characters all playing their part. For me - another winner. I'm always up for a good mystery read. I'm worried that I'll need to backtrack since this is book #26 in the series though; wow! Yes and it goes on....!!!! I am glad that you are still enjoying this series. You are way ahead of me in the series. It is going to take me years to read the whole series! It is my main effort for this year to catch up Viki! Sounds great - I like the boxes it checks. I love this series Kathryn but I need to catch up! Yes it is such a long.......... series. But so good. One of these years I will start this series! My friend loves them, and I'm not sure how I've come so far in life and avoided reading J.D. Robb and Norah Roberts. I like her writing as both, although the JD Robb ones are rather special and clever. I love the covers on the editions that you receive. Looking forward to the latest book that releases next month. You will have a great time catching up! I know Nise! I am really going to catch up. My mission for this year. And I have most of them that I have gathered.